VESSELS CALLING AT THE PORT OF VIRGINIA ARE INCREASING IN CARGO CAPACITY AND THE NUMBER OF VESSEL CALLS IS DECLINING: In May, there were 143 vessel calls as compared to 173 calls in May 2016, yet cargo surged more than 12 percent. All operational areas at Port of Virginia show growth. May sets new monthly volume record for the Port of Virginia. The new North Gate at Norfolk International Terminals will be opening at the end of June. The Port of Virginia moved 246,871 twenty-foot equivalent units (TEUs) in May, representing growth of 12.5 percent when compared with the same month last year and an all-time record for productivity at the port. The growth was seen in all areas of the operation and comes on the heels of back-to-back calls from 13,000-TEU vessels in May. 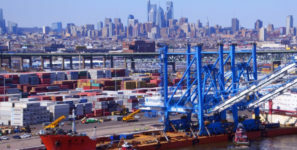 According to an analysis of the new ocean carrier alliances, The Port of Virginia is the top US East Coast port for deployed capacity for Asia-USEC alliance services with seven services deploying more than 61,000 TEUs weekly. As the vessels are increasing in cargo capacity, the number of vessel calls is, as expected, declining. In May, there were 143 vessel calls as compared to 173 calls in May 2016, yet cargo surged more than 12 percent. “The new alliances and the cargo owners are capitalizing on Virginia’s natural and man-made assets and our team is performing well,” said John F. Reinhart, CEO and executive director of the Virginia Port Authority. “This kind of volume, combined with the growth we’ve had throughout the calendar and fiscal year, tells us that the industry is confident in The Port of Virginia’s ability to handle their cargo and do it well. In addition to growth in volumes, there is other activity ongoing at the port, Reinhart notred, including the expansion of Virginia International Gateway and preparation for the opening of the new North Gate at Norfolk International Terminals at the end of June.